If this makes the novel sound too clever for its own good, nothing could be further from the truth: far from seeming smug, the narrator constantly doubts her ability to write. She agonises over whether to tell the story in the third person, and, if so, what to call the characters. She worries over what to include and what to leave out (“It occurs to me that although I used to go to a lot of parties, I describe only two”). Similarly, she often doubts her ability to remember: the opening few pages are scattered with such phrases as “I can’t remember” and I’m not sure”. 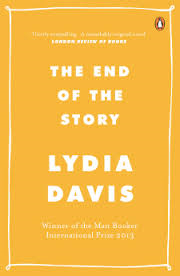 Lydia Davis’ stories are so wonderful in their brevity that there was always a danger a novel would disappoint, but The End of the Story manages to be both clever and moving, artful and honest – exactly what you would expect. It’s not unusual for a previously unheralded writer to win an international prize, but it is unusual for a previously unheralded American writer to win an international prize. 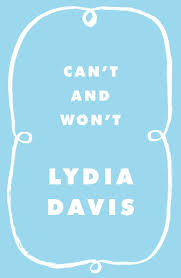 Such was the case when Lydia Davis won the Man Booker International Prize in 2013, recognition that perhaps began with the publication of her Collected Stories in 2009. This obscurity is partly explained by her chosen form – the short story – but also by the very nature of those short stories, which force the reader to question the rules and boundaries of the genre. Can’t and Won’t, the title of her latest collection, seems a reference to this very fact, a stubborn refusal to be proscribed by expectations. While its single sentence format makes it one of the shortest stories in the collection, the majority of the stories do not exceed a page. Of course, you may well argue that it is simply too short to be a story, but it is difficult to justify such a proposition with anything other than prejudice. It contains, after all, character, setting and plot. The sensation that the stories are ‘found’, however, persists throughout, with those that do not originate in Flaubert’s life seemingly arising from Davis’ own. Another reoccurring series, for example, are letters of complaint which Davis says she has sent. ‘Letter to a Frozen Peas Manufacturer’ complains that the peas inside the packet are much more appetising than those illustrated on the outside. Other stories are simply marked ‘dream’. “A fire does not need to be called warm or red. Remove any more adjectives. This, then, is the perfect short story collection. Easy to dip in to – with stories to fill even a few spare seconds – but also rewarding a thorough read through. You are currently browsing the archives for the Lydia Davis category.